When moving into a house, you can never be sure who else might have keys to it. Even if the former owners are trustworthy or have moved far away, they probably lent a spare key to a family member or a neighbor who is still in the area. These spare keys could be hanging on a hook in the neighbor's kitchen, conveniently labeled with your address, drawing the attention of their children. Former house sitters, cleaning services, babysitters, and others may have keys to your home. 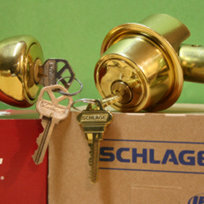 Even if your home is brand new, the contractors and real estate agents all had access to the key. If your keys have been lost or stolen, someone may use them to gain access to your home. Anytime you lose track of who has keys to your house, it's a good time to re–key the locks. Having separate keys for every lock can be confusing. This often happens when various locks have been replaced over the years. As long as your locks all have the same shape of keyhole, they can be made to work with just one key. If you have a lock that is difficult to operate, has a key broken off in it, or just doesn't work right, I may be able to repair it. Sometimes, all that is needed is cleaning & lubrication, a new latch mechanism, a slight adjustment, or new pins. Whether your old locks are badly broken, missing, or just plain ugly, I can replace them with new ones. I carry the most common residential door knobs and deadbolts. If you've picked out a new lock from a store, and you simply need help installing it, I can help with that, too. It's easy to accidentally lock yourself out of the house. If you find yourself in this situation, I can open the door for you. By using small lock picks in the keyhole, I can unlock it without damage. Generally, this only takes a few minutes. I do not drill the lock, except in extreme cases when it has malfunctioned to the point where it will not open even with the key. Doors with only a locking knob are not very secure. The latches on most door knobs extend about one half inch. It's easy for a burglar to pry the door open or use a tool to push the latch back into the door. Deadbolt locks are much more secure, with a bolt that extends a full inch into the door frame. Once it's locked, the bolt can not be pushed back into the door by use of tools. I can bore new holes in the door, and install a deadbolt above the knob. Of course, this produces a bit of saw dust. If you wish, I can bring my own vacuum to clean up afterwards.